What is Photo dynamic therapy? It is a specia l treatment performed with a topical photosensitising agent 5-aminolevulinic acid or ALA which is activated with the correct wavelength of light. Prior to light treatment, we allow the topical photosensitising agent to undergo an incubation time of a few hours on the skin in order to provide the most effective results possible. How Does Photo Dynamic Therapy Work? Then 4 specific wavelengths of lasers IPL, Blue Light and Red Light are applied toward the skin lesions, activating the photo-sensitizer in the presence of oxygen. 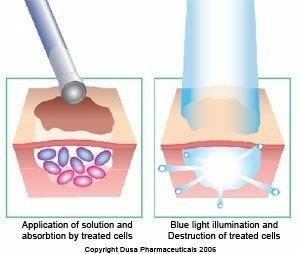 Because the photo-sensitiser is preferentially absorbed by the acne lesions and the light source is directly targeted on the lesional tissue, Photo Dynamic Therapy achieves dual selectivity, minimising damage to adjacent healthy skin. 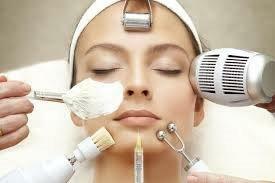 It is mediated by oxygen-dependent photo-chemical reactions, resulting in destruction of the skin lesion. The purpose of this treatment is to initiate photochemical reactions, and not to heat or mechanically change tissue as seen in other dermatologic uses. Ultimately, Photo dynamic Therapy is a very safe procedure that can provide patients with outstanding results with minimal downtime and risk. Photo dynamic Therapy triggers an inflammatory skin process that take a few days to settle. Light avoidance is essential for the first 3 days after the procedure. 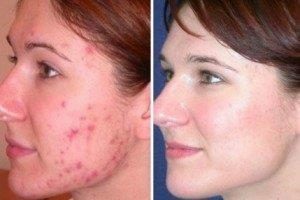 Usually 1-2 treatments are required for skin damage while acne may require 1-3 treatments.